How Do You Know When It Is Time to Buy New Software? Customer Relationship Management or CRM software is not usually one of the top concerns of CFOs and probably with good reason given the poor rate of successful CRM Software implementations. However, what you may not know is that if CRM is implemented correctly, then it can provide a wealth of very relevant and useful information for a CFO. A good CRM implementation will yield all sorts of useful data regarding everything from ROI on sales and marketing expenses to projected operations resources requirements. If those figures sound peak your interest, then read to learn about the five reasons to pay attention to CRM software. Do you ever look at your marketing budget and wonder how much you are really getting in return for those dollars? On the flip side, are you afraid to spend money on marketing because you are not sure about ROI? CRM Software can help because it can allow your sales team to capture where sales leads are coming from and track those leads all the way through to closed sales. I’ve often seen clients who thought they had a good feel for where their sales were coming from until we actually started tracking them – the results are almost always surprising. The screen print below illustrates what a good Win Report can tell you (i.e. what percentage of your business is coming from which referral sources). After reviewing the Win Report above, you may want to skip Trade Show XYZ for the next year. It cost you more than $10,000 for booth space, promotions, travel, and lost time out of the office. Trade Show ABC on the other hand, looks pretty good. Just as important as tracking where your sales are coming from, tracking why you are losing business is one of the important reasons to pay attention to CRM software. A good Loss Report like the example below will tell you which investments in additional resources will most likely pay for themselves. If you could spend $55,000 to fix your credit process, then wouldn’t you feel more comfortable doing it with the information above? Wouldn’t it be great if you could predict more accurately how much new business to expect next quarter? You could feel more confident in hiring additional employees or waiting for a better candidate based on the predicted need. The problem is that very few sales organizations provide accurate sales forecasts if any. A good CRM software will tell you not only what sales are projected to close, but what the likelihood of their closing is. Forecasts that take historical data regarding closed sales into consideration are much more likely to give you an accurate picture of impending resource needs. The average CRM database often ends up being little more than a method for your sales people to mark their territory at best or an expensive address book at worst. However, a well implemented CRM software will help your sales people implement strategy to meet your company revenue goals. In addition, they will work smarter and incorporate their sales training. Sales training is another expense that often doesn’t see the return on investment it deserves. More efficient salespeople add more revenues to your bottom line with less payroll expense. 5. CRM Software Implementations Can Be Expensive! While a well implemented CRM can provide invaluable data, a poorly implemented may end up being worthless. When implementing CRM software, you want to make sure that you spend enough. You want to make sure that you are not just purchasing the software but also providing relevant customization, training, installation and integration with existing systems. One of the most common mistakes made in implementing CRM software is forgetting about the really important investment in training users. This is especially true if the system is not particularly user friendly. If training is not well executed, then the success of the entire implementation is in jeopardy. If users don’t embrace your new CRM, then the quality of the data they input will be poor. As a result, it will yield poor quality reports that no one will trust or use. Now you’ve just wasted a huge chunk of cash, time, and energy on a useless system. So the next time your eyes start to glaze over at the mention of CRM software, perk up – you may have more to gain or lose than you previously thought. Choosing the right software is so important. 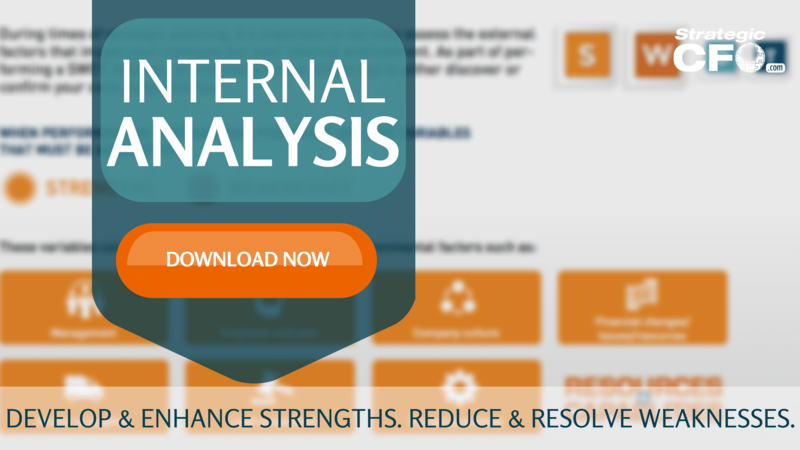 Check out our free Internal Analysis whitepaper to discover what you need strengthened and/or resolved. Then choose a CRM software that will help you accomplish those goals.